845-351-2926 or by email at tuxedohistory@gmail.com. The Tuxedo Historical Society has launched the online version of their exhibition"Society at Play" on their website. Click here to check it out. If you would like to visit and see the exhibit first hand, THS is open on Fridays from 10 am to 2 pm and by appointment. NOTE: The Tuxedo Historical Society is in need of board members. If you are interested in Tuxedo’s history, have time to volunteer and actively participate, please contact us at Tuxedohistory@gmail.com or 845-351-2926 or 845-325-4774. 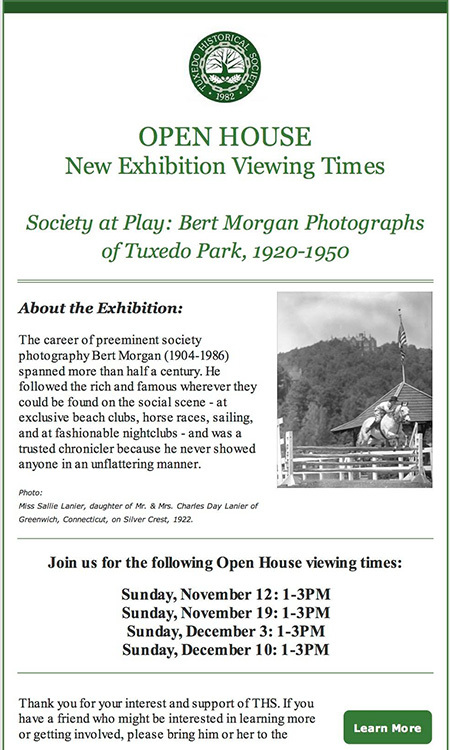 The Tuxedo Historical Society is proud to present it’s newest exhibition: “Society at Play: Bert Morgan Photographs of Tuxedo Park, 1920-1950” opening to the public on Sunday, October 29th from 2-4pm and then Fridays 10am-2pm or by appointment. 7 Hospital Road. The annual meeting will review the annual report and elect officers. We would like to hear from anyone interested in serving on the board. Former Tuxedo resident and writer Stuart McGregor will give a talk on his personal recollections and history passed down on the Kincraig Estate and its former residents. Stuart was born in and grew up in Tuxedo Park where he spent his early years living on the Kincraig Estate. Now a resident of Florida, he maintains a home in Tuxedo Park. He has published several travel books and is currently finishing a historical non-fiction piece, "The Wee Wah Beach Club in Tuxedo Park, A Unique American Story". March 5, 2017 from 3:00 - 4:30 p.m. - The Tuxedo Historical Society presents historic video interviews of former lifelong residents of Tuxedo as they describe life in Tuxedo in bygone days. Mike Crisci, born in 1906, former Town Supervisor and employee of the Tuxedo Pharmacy and Leslie Davenport, born in 1904, a plumber who worked for the TPA take us on a trip back in history to the early and mid 20th century. March 12, 2017 from 3:00 p.m. - 4:30 - Historic video interviews continue with John Modder and Mabel Tansey. John was born in Tuxedo in 1908, was the manager for H.O. Penn, a construction equipment sales company, and he was a Tuxedo judge for 20 years. Mabel Tansey was born in 1911, lived in Tuxedo Park and was a teacher and guidance counselor for Tuxedo High School, a civic leader, as well as the director of the town recreation program. NO guns, swords, dolls, currency, stamps or collectibles. Donation: $10 per item or 3/$25 benefits THS. At 3:00 p.m. free lecture "Maria Feodorovna, Mistress of Pavlovsk", "Elegance and the Enlightenment in 18th Century Russia" given by Nicholas Nicholson, SVP Furniture, Silver & Decorative Arts at Freemans. 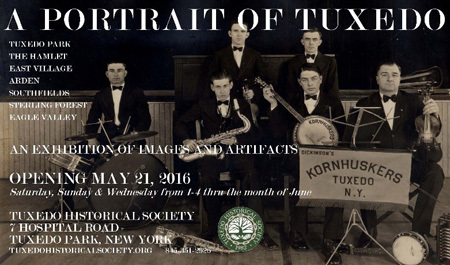 A reminder that the Tuxedo Historical Society exhibit, "A Portrait of Tuxedo: An Exhibition of Images and Artifacts" is open every Wednesday, Saturday and Sunday from 1:00 p.m. - 4:00 p.m. at the Historical Society, 7 Hospital Road, Tuxedo, NY through the month of June. Here’s what others are saying: “great representation of the town”, “wow! Impressive exhibit”, “excellent presentation”. Come and help us identify some of the people in the photos. Free admission, donations welcome! The Tuxedo Historical Society is excited to announce the opening of its exhibit, A Portrait of Tuxedo on Saturday May 21, 2016 from 1:00 p.m. - 4:00 p.m. at the Historical Society, 7 Hospital Road. The exhibit will be open on Wednesday, Saturday and Sunday from 1-4 p.m. through June 2016. We hope that the images will provide a link to our shared history and bring some fond remembrances of the past. We look forward to sharing our history with you. The Tuxedo Historical Society has launched a new website, complete with an interactive map of Town. It looks GREAT! Check it out and discover ways that you can help support this wonderful organization! The Tuxedo Historical Society is planning a photo exhibit for May of 2016 depicting the history of the Town of Tuxedo through old photos. We are looking for old photos that you have and would like to have included and would be willing to let us scan and return to you or that you would like to donate to the Historical Society. We will be making enlargements and creating an exhibit with photos and artifacts representing all the areas of the town. The photos can be of old buildings businesses, school teams, cheerleaders, school class photos, organizations, clubs, important events, items unique to your area of town. If you have items to contribute or have an interest in volunteering to help with scanning and mounting photos or help with setting up the exhibit, please send an email to bettyl1@optonline.net, william.mincey@gmail.com, or sscher5@optonline.net or call 845-351-2926 or 845-753-2580. Antiques Appraisal Day Sept. 26, 2015 11am-3pm @7 Hospital Rd. Appraisals by William J. Jenack, Appraisers and Auctioneers from Chester, NY. For a donation of $10 for one item or $25 for 3 to the Tuxedo Historical Society, experts in fine art, furniture, porcelain, glass, and silver, antiquities, art, coins, firearms, printed matter, jewelry by a GIA certified gemologist, etc. will appraise your treasures. No large furniture or firearms please, however, you may bring a photo of these items. No appt. necessary. Info: 845-351-2926 or 845-325-4774 or tuxedohistory@gmail.com. "The Tuxedo Park Autumn Ball 2014"
Saturday, October 25th, 7:00 p.m.
"What carnival is to nice, the Autumn Ball is to tuxedo..." Dance Magazine, September 1929. The Autumn Ball was, for many years, Tuxedo Park's most glamorous event and was considered to be the opening of the New York City social season. The first Autumn Ball was in 1886, the year the Tuxedo Club was founded, and was held annually thereafter until 1971 when changes societal and population changes suspended the event. 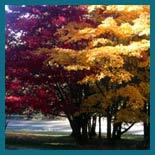 In 2011 the Tuxedo Historical Society (THS) marked the 125th anniversary of the first Autumn Ball with an Autumn Ball re-imagined for a new century. In collaboration with London College of Fashion (LCF) Autumn Ball 2011 celebrated the "Little Black Jacket" -- the garment imported from England that quickly became named for our community when gentlemen from the Tuxedo Club wore it publicly in New York City. So great was the success of Autumn Ball 2011 that the Tuxedo Historical Society and London College of Fashion have partnered again. But this year it is all about the ladies! The theme for Autumn Ball 2014 is the "Art of Dress - Celebrating Centuries of Dress Evolution", a project by LCF showcasing couture student designs inspired by dresses through the ages. Many of the student designed dresses will be on display before traveling on to events in Dubai, Shanghai and Florence. To receive an invitation to the Tuxedo Park Autumn Ball, IMMEDIATELY contact THS at tuxedoab14@gmail.com or (845)351-2926. Seating is limited. 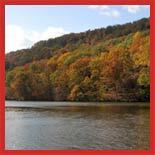 Tickets for Tuxedo Park Autumn Ball 2014 are $350, which includes a $175 tax-deductible contribution to THS. The evening will include a cocktail reception, a display of rare vintage automobiles, a sumptuous dinner and dancing to a full orchestra. Dress is black tie (of course) for gentlemen and evening glamour for ladies. Join author, Chiu Yin Hempel, as she presents stories of the Fabulous Women of Tuxedo Park. This illustrated program tells the inspirational lives of many talented, courageous, and determined Tuxedo Park women of the late 19th and early 20th century. They fearlessly blazed the trail of gender equality well before it became fashionable or even possible for women to make significant social, artistic, intellectual and political contributions to our country. The remarkable tales of Katrina Trask, Maud Lorillard, Cora Potter, Emily Post, Dorothy Draper, Anna Venezia, among many others, guarantee to captivate the audience. Chiu Yin Hempel is the author of Tuxedo Park: Lives, Legacies, Legends and co-editor of Tuxedo Park: The Historic Houses. Both books won the Excellence Award from the Greater Hudson Heritage Network. Chiu Yin has worked in senior publishing positions at Pearson and The Economist Group. A Trustee of the Preservation League of New York State, she is currently working on her third book on Tuxedo Park, focusing on its landscape and nature. The program will be held on Wednesday, October 22nd at 7:00pm at the Tuxedo Historical Society, 7 Hospital Road, Tuxedo Park, New York. Open to the public; admission by donation. Seating is limited. 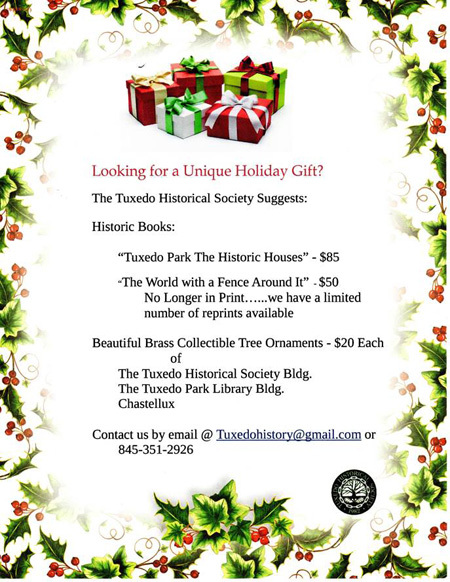 Registration required to tuxedohistory@gmail.com or (845-351-2926. Founded in 1982, The Tuxedo Historical Society owns and occupies the former Methodist Church at 7 Hospital Road. It is home to artifacts, pictures, and written material concerning the various area of the Town of Tuxedo, including the Village of Tuxedo Park. Donations of old historic papers, pictures, albums, or other artifacts are gratefully accepted. Long-time residents are urged to remember the Historical Society and its efforts to preserve local history when undertaking major home cleanings: attics, garages, basements, etc. This especially applies to Tuxedo residents and those with items relating to the history of the Town and Village of Tuxedo. Programs of interest, such as interviews on audiotape with senior residents and lectures on architecture, are held from time to time.